This post originally appeared on NickDawson.net here. Spoiler alert: I’m not dying and there doesn’t appear to be anything major wrong with me. I know, you hate spoilers. But I thought I’d get that one out of there way. It makes the rest of this considerably more pleasant for us both. I’ve got a new personal electronic medical record. I’m able to store and track my health history. I can add and edit my own notes. I can pull in data from external sources like my quantified self gadgets. I can share data with my provider, or family members. It’s secure, it’s cloud-based, it’s mobile and it’s on all major platforms. Evernote is my personal EMR. For the uninitiated, Evernote is a cloud-based, free service with apps on every major desktop and mobile platform. It’s general purpose is to store, sort and help you find anything you throw at it. You can upload a PDF, email a note, clip an image from a website. You name it, and Evernote can probably store it. Take a picture of a wine label, and Evernote will transcribe the text in the image using optical character recognition, so when you search for Zinfendel, you’ll find the image of the wine bottle. But wait there’s more. Since you took the picture with your phone, Evernote also has the gps data, time and date attached to the image. You can add some tags such as “California”, “zin”, and “jammy” to make the note even more specic and personal. Evernote has a widely supported API (applications programmers’ interface), so many other apps can read and write data into Evernote. For instance, the web-based automation service if this then that, IFTT as it’s known, will, for instance, append a line to an Evernote note every time you get a tweet; creating an effective backup solution. I personally throw everything I can into Evernote. When I book travel, and the print window pops up over the itenary confirmation, I select PDF to evernote rather than print. When an online store emails me a receipt, I forward the email into Evernote. I have more IFTT rules logging things to Evernote than I can feasibly recount, but a few stand out. When I step on my Withings wifi-enabled scale, IFTT adds a line to an Evernote note with the date, time, my weight and body mass data. I can do the same thing with my Withings blood pressure cuff. And, it turns out, Evernote is pretty much perfect as a personal EMR. In short, I get a lot of meaningful use out of Evernote. So now we have two identical multi-million dollar EMR installations, each with some data about me, but neither having a complete picture or seamless interchange. Again, I’ll point out that this is 2014 and I can FaceTime someone around the world on my phone. And we’re using faxes?!? But there is one place where I have a complete record of my health and health-related behavior. You guessed it, Evernote. Everytime I have a test done, I get an email from which ever isolated multi-million dollar Epic system at which I’m seen. I log in, and click a button on my web browser tool bar which instantly clips the entire page as both text and image and stores it in an Evernote notebook called Health. The images from my MRI? They are in Evernote. When I went into the physical, I let my physician do his HPI and med rec and then mentioned my agenda. He knows me well enough to find the humor in my proposal – hey, it’s pretty nerdy – but he graciously went along with it. He did his physical exam and then tuned control of the visit over to me. I asked if I could record the audio and did so using Evernote’s built in audio recording feature. I also scan, or import PDFs of all my insurance data including EOBs (explanation of benefits). I scan medical receipts and co-pays. So I effective also have a rudimentary revenue cycle system. 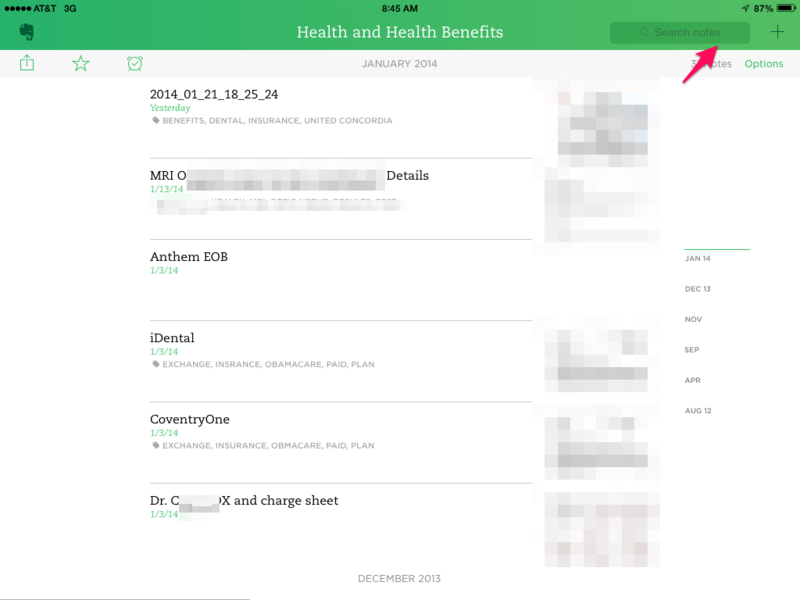 I am nearly certain, today, Evernote has a more complete, more personalized view of my health and medical history than any other system on the planet. I can share entire notes, or their contents, via secure links to anyone I chose. I can automate data intake, or enter it manually. I can capture fitness and behavior data. I can trend, search, snapshot, and review my own medical records. I can add to them any time I want, from any device. Please tell me why a multi-million dollar system is more patient-centered? I use Evernote for the same reason for everything else in my life, and used to as a PHR too for tracking a loved one’s cancer. My cofounders and I ended up making an app to solve this specific pain point though because Evernote wasn’t quite as collaborative as I wanted for family members and I prefer automatic health data retrieval to manual entry. I’d love to hear what you think about what we’ve built: Prime, a mobile app that lets you get your health records automatically and instantly from any doctor (including all MyChart users, since you mentioned it). You can view them all together on your phone. You can share individual entries privately with family/friends in Prime. You can add notes. We also support 70+ wearables with automatic integration too. Also you should totally reach out to the Evernote team about this. They love these kinds of stories. Wow, it’s going to be hard to “flip the clinic” if everything is nailed to the floor. Thanks, Nick, for describing both an awful present and a very cool possible future. And thanks, Tyler, I’m going to check out Prime. Smart stuff but/and my favorite part? The lede: “Spoiler alert: I’m not dying and there doesn’t appear to be anything major wrong with me.” Provided a much-needed laugh. Thanks, Nick! I can’t believe I didn’t see this post until today – I am an Evernote super fan, and even got their scanner recently to deal with just about everything else in my life. I broke my hand earlier this year and have had surgery, dozens of OT and follow up appointments, and am able to effectively share the important information with the people who need to see it – and I didn’t have to lift a finger to do it. Thanks for sharing this – like i said, this household uses Evernote for just about everything but healthcare.